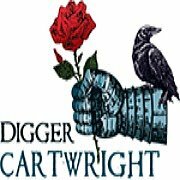 Orlando, FL November 4, 2014—The office of mystery novelist Digger Cartwright has released the following statement from Mr. Cartwright regarding the 2014 mid-term elections. “It has been quite some time since I’ve commented on politics in America. I like many other Americans have become disillusioned by the current political landscape. The dysfunctional Congress has accomplished virtually nothing the last two years. The House has been stymied by a lackadaisical Senate which has been unwilling or unable to do anything meaningful. The President has shown little leadership either. It’s almost as if Washington has itself become disillusioned with the political gridlock and has given up. This is disheartening. The election seems to have been largely overshadowed by ISIS and Ebola and whatever else the media wants to focus on each day. Noticeably absent from our national dialogue is the national debt, which continues to rise rapidly, the fiscal irresponsibility of the federal government, namely our elected officials, and continued high unemployment despite the headline numbers which are grossly misleading of the reality of the American jobless recovery. Despite this, there are still some very hotly contested gubernatorial and congressional races, and the future of America may well be shaped by this election. I see this as a vote of confidence in how the country in currently being managed. With recent polls showing that nearly three quarters of Americans believe our country is heading in the wrong direction, it is understandable why there is such frustration with the political system, politicians, and incumbents. While I think today’s election is largely a vote of confidence in the Democrats and their agenda, I believe the underlying problems are the result of inept leadership of both Democrats and Republicans. There is no one in government right now at the federal or state levels who is without sin. Sadly, most Americans believe they are voting for the candidate who represents the lesser of two evils. This is very sad for our country, and it is a problem that is not easily resolved. Most Americans no longer respect politicians. They see the political system as corrupt and sleazy. They think all politicians are simply trying to enrich themselves instead of looking out for their constituents. They believe that Washington is increasingly isolated from the rest of America and ordinary Americans’ problems and concerns. They are repulsed by the onslaught of negative attack advertisements during the political season. As a result, they are becoming more distrustful of Washington and more detached from the political process. I share many of these same sentiments, and I’m also frightened by the detachment from the political system. Tyrants thrive on a detached populace. There is an old saying that all it takes for evil to triumph is for good men to do nothing. For this reason alone, it is incumbent for each American to do their civic duty and vote. While being engaged in the political process is increasingly less attractive to ordinary Americans, it is important to know the issues and know the candidates. Yes, it takes time, and time is a precious commodity for most of us. There are some things in life that we just have to take the time to do for someone or something other than ourselves. Taking the time to familiarize ourselves with the issues and the candidates beyond the negative attack ads is giving time to a cause bigger than us. I encourage Americans to take some time before you vote to do just a little research about the candidates then vote for the person you believe will do the best job, and remember to look at the third party candidates as well. Sometimes it isn’t easy to do this and the path of least resistance is to go to the polls and punch straight party ticket, which is certainly every voters’ right. I would like to see more voters make informed decisions when it comes to voting. The lack of confidence in Washington and politics across the nation is a problem that can be remedied by those in politics. Rather than running non-stop attack ads, how about talking about what you’ve done? I would like to see the election process reformed so that political ads can only talk about what the candidate has done or is proposing to do and their platform. How about good, clean campaigns? Negative attack ads are a great disservice to the people and only turn the voters off from wanting to engage in the political process. Isn’t there something called truth in lending? How about truth in campaigning? Let’s get rid of the rhetoric and propaganda and political spin and focus on the cold hard facts and reality. How about less finger pointing and blaming someone else for shortcomings or failures or problems and having the decency to accept responsibility for the inability to get things done or past inadequacies or failures? The American people appreciate humility and accountability but hate deceit and arrogance. Changing the political character may be a fanciful dream, and I know it is unlikely to happen overnight. Whether change comes or not, there is no excuse for voters not to vote and not to educate themselves about the candidates and issues. It is an easy and painless process, and it is our civic duty to exercise our right vote. It is a very American thing to do, and I hope that everyone will get out today and vote. The future of our nation is in our hands every election. This entry was posted in Uncategorized and tagged #election, #ivoted, politics. Bookmark the permalink.